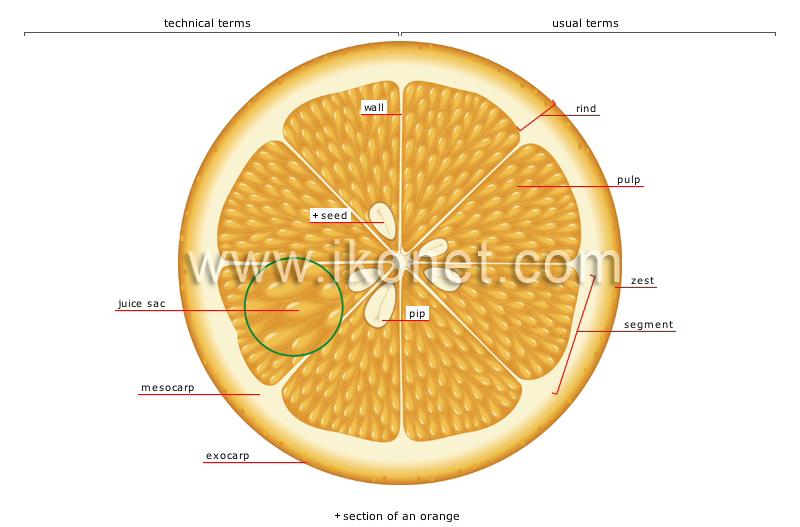 Designates the whitish part of the rind of a citrus fruit. Each of the small juice-filled pockets that combine to make up the fruit’s pulp. Thin membrane separating the citrus fruit into segments. Fruit’s outer layer covering the pulp, composed of an outer colored part and an inner part made of whitish tissue. Fleshy portion of the citrus fruit, composed of small juice-filled pockets in every segment. Outer scented layer of the citrus fruit’s rind. It produces an essence used in baking and an essential oil. Part of a citrus fruit surrounded by a thin membrane containing the pulp and seeds; each segment derives from separate ovaries within a single flower.